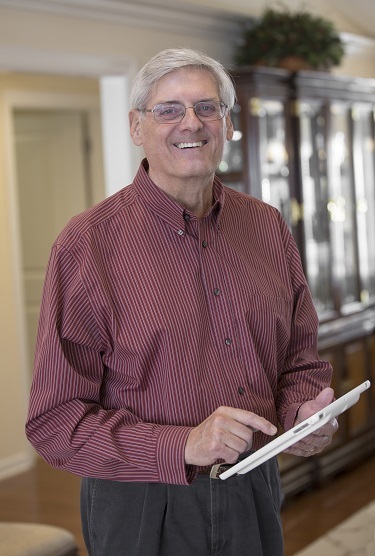 Knowing its residents were coming to expect the convenience of smart home options and that technology is critical to the future of senior living and home care, Masonic Villages sought to offer user-friendly options which balanced affordability and innovation. It began piloting a resident portal and home automation features at its largest campus in Elizabethtown, PA, and staff developed plans for a “smart cottage,” an incubator for new technology. It was the result of a partnership with K4Connect, a company that integrates smart technologies into a single system for older adults and individuals living with disabilities. After thorough testing and trials, the benefits are now being rolled out to Masonic Villages’ other campuses across the state. From April 2016 through April 2017, Masonic Village at Elizabethtown launched 2 pilots with residents to test the capabilities of K4Community. their new cottage. Photo courtesy of Masonic Villages. It includes home automation features (light switches, thermostats, pedometers, motion sensors and more), operated though a K4Box, and a resident portal referred to as Village Connect, which is an application accessible through desktop computers, tablets and smartphones. Village Connect allows residents to: control home automation features; monitor their wellness (fitness trackers, time in bed, pill reminders, etc. ); connect with others through secure voice/video calling, photo sharing and messaging; check community activities, dining menus, resident directories, campus news and weather; and request maintenance services. One of the main advantages of the software is that it is “future-proof”: New technologies can be continually integrated as the pace of development accelerates. It is also a priority for Masonic Villages to see cost savings on utilities through smarter environmental controls, reduced printing costs due to increased digital communications, and staff efficiencies as tasks are automated (e.g., maintenance requests). The pilots were a necessary step because it was important that residents understood the value of the technology, were educated on how to use it and could provide input for improvements before it was rolled out to everyone. With a 100% adoption rate for the home automation feature and an 88% adoption rate for Village Connect, the pilots were deemed a success. The pilots also helped staff identify residents who could act as cheerleaders, assisting and encouraging others to use Village Connect. The increasing popularity of the “Internet of things” has led to horror stories of hackers gaining access to individuals’ private networks, whether it’s through a baby monitor, a smart thermostat or other devices. Masonic Villages and K4Connect have taken precautions to mitigate the risk. The K4Box and all related smart devices run on a separate network from the one Masonic Villages’ residents, guests and staff use. This is both for security and to simplify remote troubleshooting, so K4Connect’s network operations center can directly assist residents with technical issues and monitor the security of every device. In April 2017, Masonic Village at Elizabethtown began constructing 72 new cottages. One, the “smart cottage,” has been fully equipped with smart home technology. Residents Fred and Brenda Kaylor, who moved in last December, have graciously agreed to test new products, allowing staff to gather data and determine which features could provide the greatest benefit to other residents in the future. Features include a thermostat and lights that can be programmed through Village Connect. All the window blinds are automated, and the kitchen sink features a touchless faucet. The bathroom scale can be linked to Village Connect, allowing users to track their weight and body mass index. A sensor on the refrigerator door ensures it isn’t left open and monitors whether it has been used over a designated period of time. The cottage’s infrastructure includes an air filtration system. If something goes wrong with the furnace, air conditioner or lights, a maintenance worker will automatically be notified through K4Connect. These are only a few of the technology offerings in the cottage. maintenance services. Photo courtesy of Masonic Villages. The smart cottage is about more than buttons and gadgets. The angled cabinets, countertops, sink and easy-access pantry, as well as zero-barrier showers and pocket doors, are all designed to accommodate a walker or wheelchair as residents age in place. Closets include different levels of shelves and bars. Raised planters in the backyard can be used while standing or sitting. Residents can also opt for safety features such as bed sensors that monitor whether they’ve gotten out of bed over a certain period of time (alerts may be sent to Masonic Village staff or a resident’s family member). The 71 other cottages are near completion, and each is equipped with a K4Box, which will control any smart home devices residents choose to add. The cottages also include devices that may be controlled through Village Connect: one light switch in each bathroom, bedroom and in the living room, and a thermostat. A motion sensor with light activation is included in all master bathrooms. As of April 2018, Village Connect is available to all residents in Elizabethtown who opt to use it. Even those on campus who may not be able to afford a computer, laptop or smartphone have access to a tablet, if they choose, so they can use Village Connect. During a yearlong study of usage, 100% of those who had access to Village Connect used it, with more than 50% accessing it daily or multiple times per day. The top feature was dining menus, which were accessed 17,322 times over a year. By the end of the year, all Masonic Village at Elizabethtown residences will be equipped with a K4Box to allow connection to smart technology and motion sensor lights in the master bath, that if not activated within a certain time period, will trigger an alert to staff to check in with the resident (with their consent). 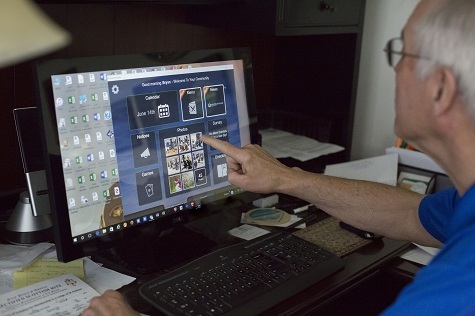 Masonic Villages has launched the Village Connect portal at 3 of its other campuses in Lafayette Hill, Sewickley and Dallas, with plans to implement other smart technologies at those locations in the near future. Masonic Villages also plans to offer a home health care package to residents, and eventually to patients in the community, which will include health monitoring and vital sign tracking that can be accessed by whomever the individual permits, providing safety and peace of mind. Staff have introduced the program to Penn State University and Penn State Health for additional research and partnering. With these technological advances, residents have access to a world of convenience and engagement at their fingertips—a smart move today and for the future. See a video featuring resident Fred Kaylor talking about his smart cottage. Debra Davis is public relations manager for Masonic Villages, Elizabethtown, PA.